Ground Penetrating Radar Systems, LLC. – GPRS of Wisconsin was contacted by large contracting company to locate the fiber optic, electrical, and any other sub surface utilities or anomalies. This site was in Green Bay, Wisconsin. Where the utilities were to be located were around a large cell tower. There were many ground wires running in these areas, but our ground penetrating radar and radio detection equipment was able to locate the lines in search. GPRS, LLC. was informed there was only one fiber optic line running through the area, but GPRS, LLC. located two fiber optic lines. GPRS, LLC. also identified the electric line running through the area. This allowed for the excavators to dig safely and keep costs down. The locating of these utilities is a nominal fee in comparison to the thousands of dollars it would cost to repair all of the utility lines. 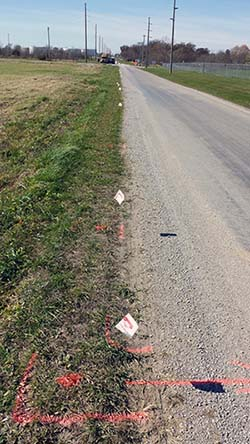 GPRS conducted a 4-way sweep for a large pipeline company in the Midwest. They desired to erect a new facility but needed to know of any existing utilities before breaking ground. GPRS found all utilities on record, and the contractor proceeded without incident. Please contact Justin Womack at (314) 412-9806 or Sam.heisman@gp-radar.com to schedule service or for a quote on your next project. A local contractor tried to bore a path into a building in order to run a new water line. Upon entry into the building, the bore head lost its wireless link with the bore beacon, and its point of entry could not be determined. GPRS scanned the entire wall and found the point where the bore head had penetrated a few inches. This verification set the job back on schedule and ensured against any potential facility damage. When a new fence needed to be installed, they contacted Wade Vickers of GPRS Oklahoma to locate private utilities within the posting area. 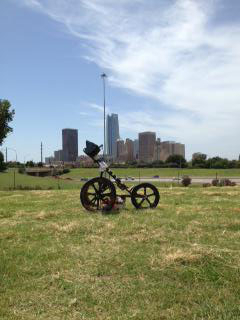 Using Ground Penetrating Radar, Wade Vickers located multiple gas, electric, and water lines within the area. 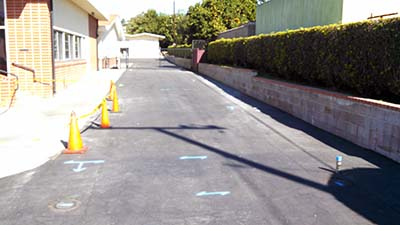 Since the results were marked with pin flags and orange marking paint, the customer was able to avoid the underground utilities during installation. 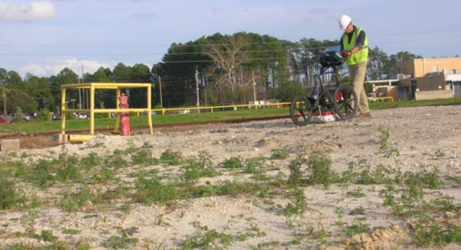 GPR is non-destructive, non-hazardous, time efficient and gives immediate results. Ground Penetrating Radar is a new technology that is extremely helpful to mark out reinforcing steel, conduit, post-tension cables, pre-stressed cables and other pertinent obstructions that lie within a concrete slab. 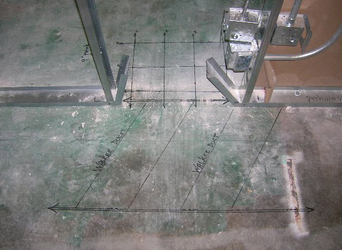 GPR is applicable on elevated slab, slab on grade, and as you’ll see in this entry, cement walls. Ground Penetrating Radar Systems, LLC. is of the top GPR companies in its industry and has grown to provide GPR services nationwide. GPRS Project Managers were recently contacted in Central Florida for concrete scanning at a large facility being constructed. Throughout the construction of the building there have been many changeovers. 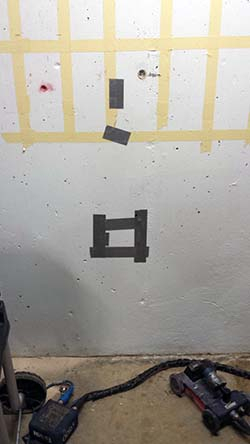 The scope of this job was to scan multiple walls on the ground floor to locate electrical conduit within the concrete wall before new holes were core drilled. It was essential that the conduit be located and not destroyed in the core drilling process. A GPR scan was performed to locate reinforcing steel and conduit prior to core drilling through the 12” thick wall. Miami Dade College needed to update their records for utilities on site. The area that needed to be scanned, using ground penetrating radar, was their Kendall campus. Thus they contacted specialists in concrete scanning, GPRS. This is an ideal application for ground penetrating radar as utility detection and CAD file drawings are GPR specialties. GPRS, LLC. from Miami, FL took the call and mobilized to the site. 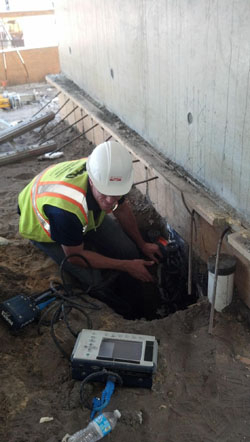 On site, GPRS was able to detect water lines and gas lines, as well as other utilities. 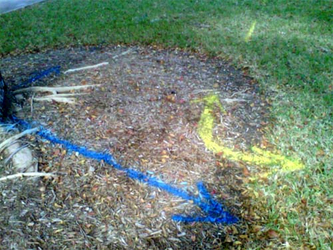 They marked them on the ground with colored spray paint and flagged them with depth estimates. GPRS then collaborated with Rene, with Kaufman Lynn to update the CAD files. Glenn Zebrowski of GPRS updated the schools files. The project was a success and why radar is “The New Way to X-Ray”. A contractor needed to drill penetrations through an elevated slab with post-tension cables and embedded electrical conduits to install electrical lines. The area that needed to be scanned, using ground penetrating radar, was located in a condominium master bedroom on the 3rd floor. Thus they contacted specialists in concrete scanning, GPRS. This is an ideal application for ground penetrating radar as conduits and post-tension cable locating are GPR specialties. GPRS, LLC. in South Florida took the call and mobilized to the site. On site, GPRS was able to identify all the obstructions quickly and accurately. Ron Anderson clearly marked all post-tension cables and conduits directly on the slab. GPRS then collaborated with the contractor, as to the best places to drill to avoid striking a conduit or a post-tension cable. The project was a success and why radar is “The New Way to X-Ray”. Ground Penetrating Radar Systems was recently called to locate piles beneath a concrete slab on grade at NASA in Hampton, Virginia. Scope of work was to scan a 30’ x 30’ area in the basement of a building to locate and map out underground piles so the engineers on site could core drill and test the composition and structure of the existing piles. They were not sure if the piles were concrete or possibly made of a wood material. There were several piles that were said to be in the area according to old drawings from the building. We also were asked to map out the rebar in the slab so they could get a clean core sample when they went to drill by the piles. 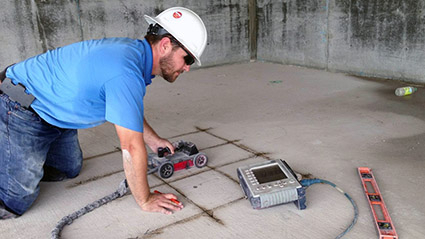 Ground Penetrating Radar is an effective and efficient way of locating material in a concrete slab and underground. It also allows us to provide a depth to how deep the material is. Ground Penetrating Radar Systems of New Mexico recently assisted Synergy Systems Construction of Merriam, Kansas on a project in New Mexico. 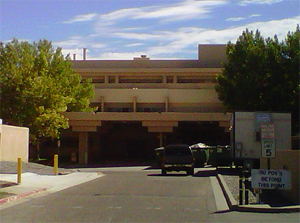 The Kirtland AFB Clinic in the Albuquerque area was undergoing renovations that required coring of the concrete slab in several locations. Traditional concrete x-ray of the floor slab was not possible with the Clinic being an active hospital as well as an active job site. Radiation is not emitted during concrete radar scan. Ground Penetrating Radar Systems, LLC. - GPRS of Nevada was contacted by a large general contractor to locate underground utilities prior to installation of carports with solar panels in Las Vegas, NV. The contractor was not allowed to damage any underground utilities such as the electrical conduits or the water lines that run underneath the asphalt. 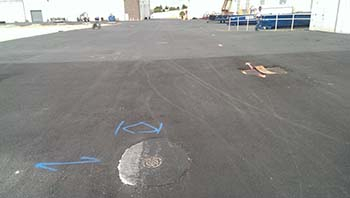 GPRS was able to locate and mark the underground utilities onto the surface of the asphalt so that the excavation could be performed without cutting through them. Ground Penetrating Radar is a great tool to locate underground utilities prior to digging or excavating and can also be used to scan areas for post tension cables, rebar, and conduits, including PVC pipes. Please contact Ground Penetrating Radar Systems (GPRS) to learn how we can assist with your project. To locate rebar, post tension cables, voids, conduits, pipes or utilities in concrete or underground please contact us today. Ground Penetrating Radar is an excellent option to locate radiant heat tubes in a concrete slab. A homeowner in Norwell, MA had a situation where they needed to place anchor bolts in a concrete slab to secure a car lift inside the garage. 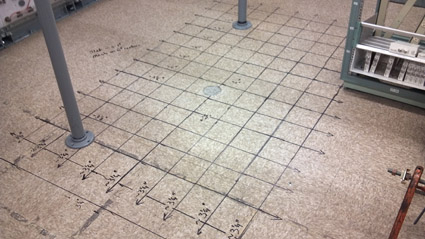 The homeowner contacted Ground Penetrating Radar Systems of Massachusetts to mark out the path of the radiant heat tubes. 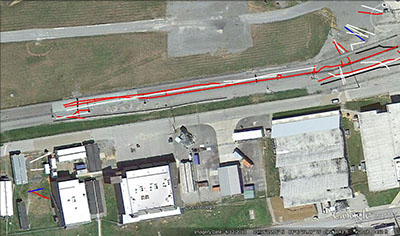 GPRS mobilized to the site the same day to perform the GPR investigation. GPRS marked their findings directly on the garage floor surface so it was clear where the radiant heat tubes were running. They also marked the depth of how deep the radiant heat tubes were in the concrete slab. The homeowner was able to insert the anchor bolts without compromising the radiant heat & costing him a lot more money to break up the floor. 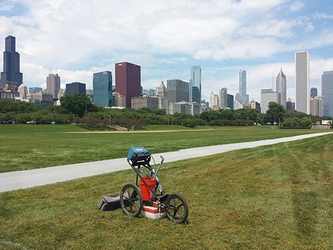 GPRS was contacted by an electronics/entertainment company to locate underground utilities at Grant Park in Chicago, IL. The customer played a key part in the setup of Lollapalooza. They needed to excavate trenches to bury all the necessary cables for the show. 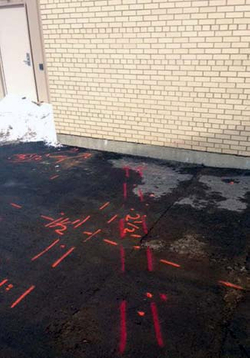 The technician on site, Brian Cox, used GPR to locate and mark out the underground utilities. The customer could then use this information when they excavate to prevent costly damages to existing utilities and also potential delays. For GPRS applications in Northeast Illinois, including the Chicago and Rockford areas, call (312) 882-0429 or (815) 218-1122 or email brian.cox@gprsinc.com. Ground Penetrating Radar Systems, LLC. 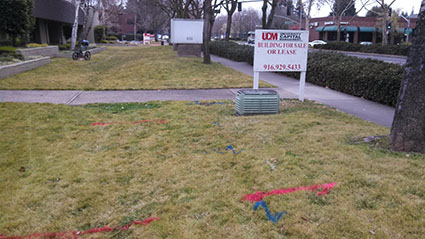 was contacted by a contractor to locate underground utilities along their proposed trench path. 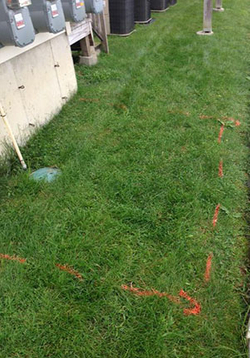 The ground penetrating radar unit detected multiple underground utilities within the proposed trench path. 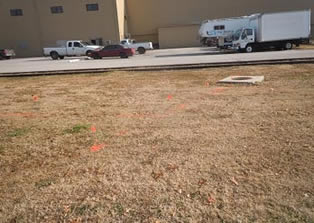 As seen in the picture, a water line and two anomalies were marked out. This saved time for the contractor and gave confidence to the trenching process. We use the latest ground penetrating technology to provide critical information on utilities, materials, and other potential obstructions within existing structures or underground. Fast and reliable, GPRS provides both two- and three-dimensional images of the scanned areas without delivering any radiation. All of our equipment is registered and meets all standard FCC regulations. Ground Penetrating Radar technology provides critical information concerning anything that lies below the surface. This technology has been used for a variety of scanning purposes, but it is commonly used to determine the location of underground utilities, rebar, post-tension cables, electrical conduit and other impediments. This technology works in a fast and reliable manner. It is also very safe, as it uses no radiation. We are able to provide a 2 Dimensional and a 3 Dimensional image of the areas we scan. All of our equipment is registered and meets all standard FCC regulations. Ground Penetrating Radar Systems of Tennessee was able to work with a contractor to scan hundreds of feet of a trench line for underground utilities. GPRS uses Non-Destructive testing equipment to locate piping, underground electrical conduits, and other utilities that are unable to be seen. Using GPS we were able to capture all of our findings and create a map of the utilities to the customer. Using GPRS is a safe, cost effective way to make sure you can safety dig or trench without cutting into utilities. Other services we offer are: Underground utility location, Conduit Locating, Underground storage tank location, Void Location and more. If GPR services are needed in East Tennessee, call Dave Schaff at (423) 667-0456 or email at dave.schaff@gprsinc.com. Hodorowski Homes, out of Schenectady, New York was called in to repair cracks found in the cement foundation at an apartment complex in Albany, NY. Hodorowski had a couple options in determining why the cracks were occurring: they could either go into the homes and conduct boring tests, which would have ruined the residents’ floors, or determine if there may be a void present with ground penetrating radar. They decided that using the non-destructive form of testing would be most beneficial. Hodorowski then contacted Ground Penetrating Radar Systems, LLC, to determine if, and when they would be able to locate the possible voids. When they called the technician that covered the Albany area they were pleased to hear he was available to complete the project that day! 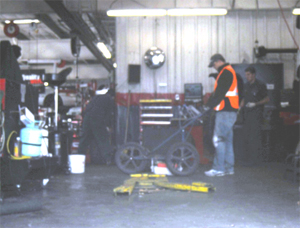 The Denver office of GPRS was hired to locate any underground utilities in the Littleton, Colorado Firestone Automotive Center. 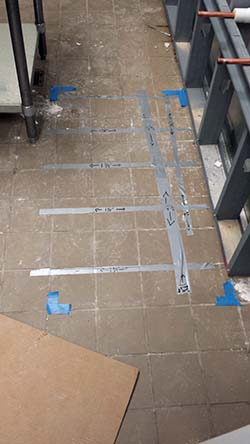 There was an area that was scheduled to by saw cut and needed to have any impediments below the slab identified prior to concrete saw cutting. The GPRS Project Manager used GSSI GPR equipment to look in and directly under the concrete for any piping and/or conduits as well as up to 4 feet below the concrete slab to locate any pipes and/or duct banks. 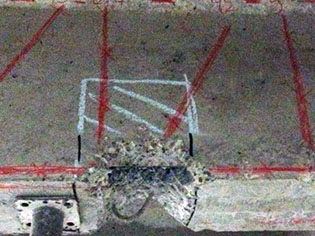 A hydraulic line was located in the slab. 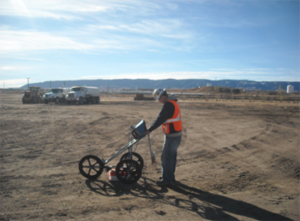 As you can see in the image below, when locating conduits in the Denver area by using GPR the depth to each conduit is able to be given. Ground Penetrating Radar Systems, LLC. of Texas was contacted by Investigative Engineering Services (INVENG LLC) to perform Ground Penetrating Radar services to locate and give an approximate depth of the existing underground utilities in Arlington, Texas. Ground Penetrating Radar is a non-destructive testing method that can be performed in real time and occupied areas without closing an intersection or disrupting the traffic flow. Scott Clay was able to identify and mark the underground utilities directly onto the top surface. Scott Clay serves as the Regional Director for Texas, Oklahoma & Arkansas. He can be reached at scott.clay@gprsinc.com or by phone at (214) 471-9001. Contact Scott Clay today and see how Ground Penetrating Radar Systems, LLC. can assist you on your project. As with any large downtown office building, there is a tenant turnover and office space renovation being completed on a frequent basis. Ground Penetrating Radar Systems is often called on many of these occasions and this job site story is no different. GPRS was contacted by a local contractor based out of Sanford, FL. The contractor had been made aware, by building management, that the elevated concrete floors of the high rise building contained multiple walker ducts and electrical conduits. A walker duct is a large metal duct poured into the concrete to run large quantities of electrical and data cable without disrupting/obstructing the ceiling below. The contractor wanted to be sure that they did not hit any of the embedded elements listed and therefore determined that they should concrete image or x-ray the slab before core drilling. 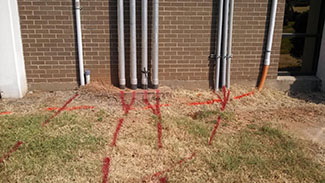 Ground Penetrating Radar Systems of Tennesssee worked with a local electrical company to locate utilities prior to playground expansion at a private elementary school in Memphis. 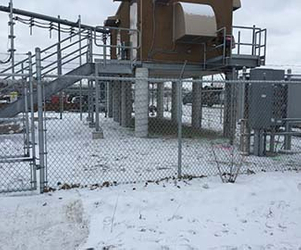 GPRS uses non-destructive testing equipment to locate piping, power-lines, underground storage tanks, and grave sites that are unable to be seen. Using GPRS is a safe, cost effective way to make sure you can safely drill or dig and not destroy any underground utilities or determine if USTs do or do not exist on a property. Other services we offer are: Post-Tension Cable Location, Conduit Locating, Rebar Locating, Void Location and more. If GPR services are needed in Tennessee, call Casey Barefield at (901) 233-9964 or email at casey.barefield@gprsinc.com.